Today is Martin Luther King’s Birthday, which is a Bank Holiday in the United States. As a result, the Economic Calendar is relatively light today. US Federal Reserve Bank of Boston President Rosengren spoke from San Diego. He made comments about Fed policy and how the policy framework should be updated. He said that further drops in the Jobless rate risk undermining recovery. He also spoke about inflation and said that the Fed could set medium-term goals and inflation ranges, and sited the benefit of targeting the 1.5% to 3.0% inflation range. He laid out the case for the Fed to switch to an adjustable inflation goal within a fixed range. He said that a low and fixed inflation target is a potential problem but lower than expected inflation is not a problem near-term. French Consumer Price Index (EU Norm) (YoY) (Dec) was released on Friday, coming in at 1.2%. The number was expected to be unchanged at 1.3%. 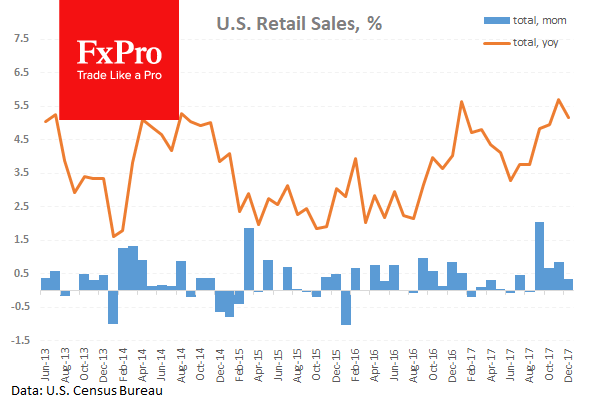 US Retail Sales (MoM) (Dec) were released as expected at 0.4%, from 0.8% previously, which was revised up to 0.9%. Retail Sales ex Autos (MoM) (Dec) came in as expected at 0.4%, from 1.0% previously, which was revised up to 1.3%. Retail Sales (Dec) Control Group was 0.3% v an expected 0.4%, from 0.8% prior. Consumer Price Index (YoY) (Dec) was as expected at 2.1, from 2.2% previously. Consumer Price Index Ex Food & Energy (YoY) (Dec) was 1.8% v an expected 1.7% and 1.7% prior. Consumer Price Index Ex Food & Energy (MoM) (Dec) was 0.3% v an expected 0.2%, from 0.1% previously. EURUSD fell from 1.21482 to 1.21120 after this data release. German Buba President Weidmann spoke at the Ludwig-Erhard summit, in Bavaria on Friday. He said that announcing the end date of QE is justifiable and that full policy normalization would be a long path. He also said that the imminent risk of a change in rates was currently low and that price trends were in line with goals. EURUSD fell from a high of 1.21534 to 1.21216 when the comments were made. The Baker Hughes US Rig Count number was released with the headline number coming in at 752. The prior number last Friday showed that there were 742 Oil rigs in operation. EURUSD is up 0.09% overnight, trading around 1.22140. USDJPY is down -0.15% in early session trading at around 110.830. GBPUSD is up 0.15% to trade around 1.37481. USDCAD is down -0.07%, trading around 1.24473. Gold is up 0.33% in early morning trading at around $1,342.02. WTI is unchanged this morning, trading around $64.35. At 07:45 GMT, Eurozone Trade Balance n.s.a. (Nov) will be released. The expected number is €28.2B from €18.9B prior. 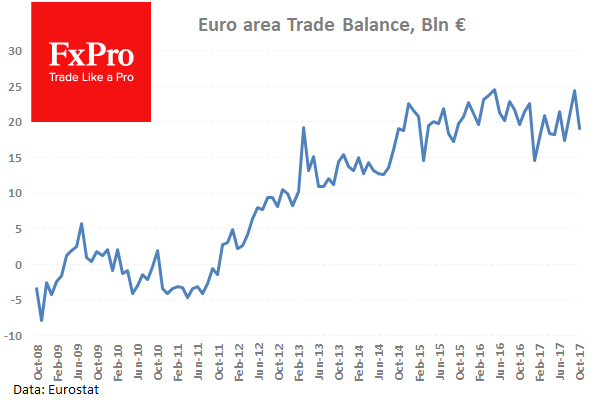 Eurozone Trade Balance s.a. (Nov) is expected to be €22.3B v €19.0B previously. EUR pairs will be influenced by this data point. On Tuesday at 09:30 GMT, UK Consumer Price Index (YoY) (Dec) is expected out at 3.2% v 3.1% previously. GBP crosses could be moved by this and other data released at this time. On Wednesday at 10:00 GMT, Eurozone Consumer Price Index (YoY) (Dec) will be released. 1.4% is the consensus number from 1.4% previously. Consumer Price Index – Core (YoY) (Dec) is expected to be unchanged at 1.1%. At 15:00, Bank of Canada will release their Interest Rate Decision and Rate Statement. 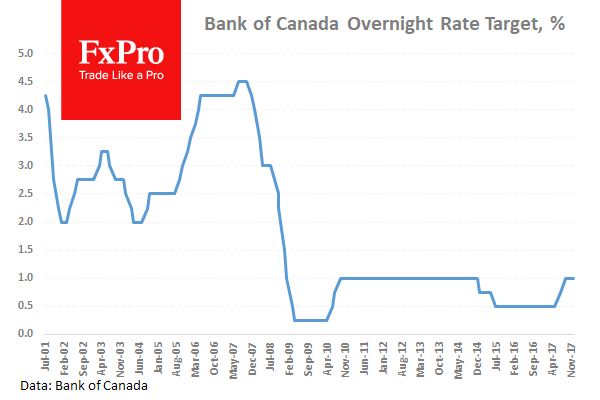 It is expected that the rate will be 1.12% from 1.00% previously. The Monetary Policy Report will also be released at this time, followed by a Press Conference at 16:15 GMT. On Thursday at 00:30, Australian Unemployment Rate s.a. (Dec) will be released with the consensus pointing to an unchanged value of 5.4%. Participation Rate (Dec) is expected at 65.4% v 65.5% previously. Employment Change s.a. (Dec) is expected at 24.9K v 61.6K prior. At 02:00 GMT, Chinese Gross Domestic Product (YoY) (Q4) will be released. The previous number was 6.8%. Chinese Gross Domestic Product (QoQ) (Q4) was 1.7% in Q3.